Starring: Woody Harrelson, Juliette Lewis, Robert Downey Jr.
A pair of psychopathic killers on the run become celebrities. 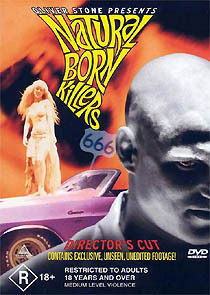 Oliver Stone's intensely controversial 1994 movie Natural Born Killers is available in two separate versions on DVD. The UK Region 2 version contains the film's MPAA-approved theatrical edition. The Region 1 and Region 4 (Australian) discs contain the director's intended version, which restores about a hundred and fifty edits made to obtain an R rating. This added footage amounts to little more than a couple of minutes of material, but completely changes the tone of the movie. When the MPAA reduced the violent content they almost eradicated the point that Stone was trying to make: with the cuts restored the violence becomes more pointedly comic, and many of the accusations levelled against the movie are nullified. Potential customers should immediately discard any thought about getting the Region 2 disc, since its MPAA edition of the film is effectively neutered. The film, about a homicidal young couple (Woody Harrelson, intense and aggresive and Juliette Lewis, quixotic and lithe) on the run, is a tour de force of cinematic technique. Stone employed a variety of different film stocks to stunning effect. The Region 1 version, from Trimark isn’t anamorphically-enhanced, which is reason enough to opt for the Region 4 release. The widescreen (1.85:1) image is certainly vibrant on either version, but the added benefit of anamorphic enhancement makes any extra effort in getting the Region 4 disc worthwhile. The sound, in Dolby 5.1 is often quite astonishing, supporting the film’s exaggerated depiction of reality. The supplements are numerous, and include seven lengthy deleted scenes, including a courtroom trial sequence which features Ashley Judd, a Denis Leary rant, and a bizarre scene featuring two amputee body builders. There’s also a half-hour retrospective documentary, Chaos Rising – The Storm Around Natural Born Killers, which examines the media whirlwind that enveloped the film’s theatrical run. It contains behind the scenes footage and candid interviews. The icing on the cake is a commentary track by Stone, which details the battles with the MPAA, and provides genuine insight into the film and it’s creator.